Looking for the chickpea cookies from Pinterest or Facebook? Here’s the original recipe! Scroll to the bottom of the post for a how-to recipe video. Chickpea cookies! Chickpea cookies with no flour, no oil, no white sugar. These are just full of chickpeas. And they’re my very favorite healthy cookie so far! * I don’t know if they really classify as cookies so I’ll go with cookie dough bites. * 2017 update: this post is 5 years old and I have a new favorite. 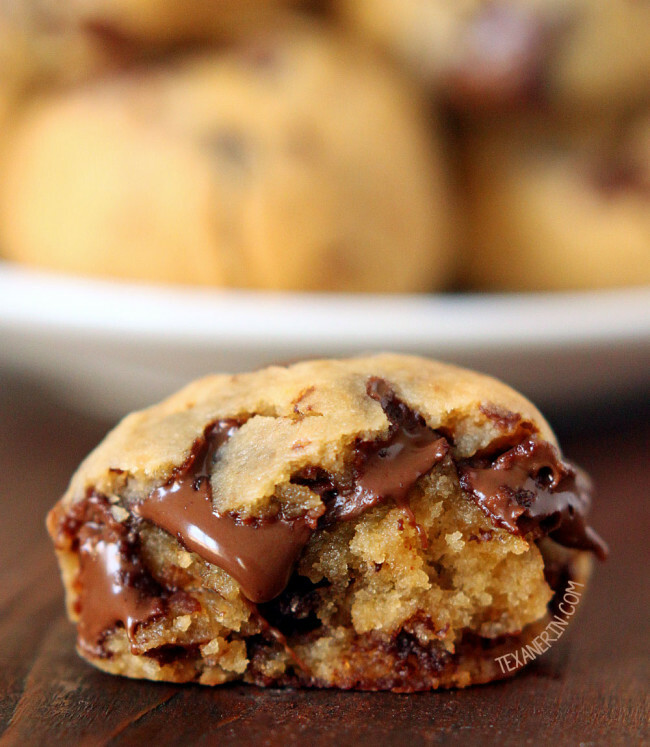 :D You HAVE to try these paleo chocolate chip cookies if you haven’t already! There’s also a vegan option. And for hot summer days, these no-bake oatmeal cookies (naturally gluten-free + vegan) are my favorite! I used homemade peanut butter in these cookies but store-bought (the kind with just peanuts and salt) works just as well. Here’s how to make peanut butter! There’s also a video included. All you need is peanuts and a food processor (which you already have to pull out for this chickpea cookie recipe!). These need the chocolate. Don’t go making them without the chocolate and then tell me that they weren’t sweet or gooey enough! These would be incredibly boring without the chocolate. And for some weird reason, these cookie dough bites do not taste yummy in dough form. Baking them somehow brings out the sweetness and peanut butter flavor. Or maybe it’s just all that melted chocolate. These aren’t the most beautiful cookie dough bites, but fresh out of the oven, with all that gooey chocolate, I bet you can’t tell that these are made with chickpeas. Or are grain-free. But cold? Yuck. These need to be warm! You can either freeze the balls and pop a few in the oven whenever it’s on, or simply put them in the microwave until they’re warm and gooey again. By the way, if you’re a peanut butter lover like I am, you have to try these peanut butter balls. They’re also gluten-free and have a vegan option! Tons of people have posted the nutritional analysis for these. They’re supposedly anywhere between 80-130 calories, which seems like a huge range to me. 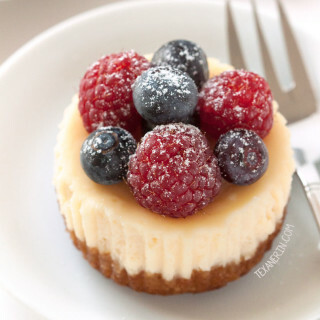 Please use a recipe analyzer like on CalorieCount if you need more information. You can use almond butter, sun butter, or whatever nut butter you like. The peanut butter should be the kind with only peanuts and salt. No added fat or sugar. Be careful because there are some “natural” brands out there which aren’t really natural. I find that this peanut butter is usually expensive so I make my own. You can make your own in only 5 minutes with a food processor. Check that out here. Chickpea flour won’t work. I don’t think plain hummus will either. I haven’t tried anything other than chickpeas but others have used butter beans, navy beans, red kidney beans, great northern beans, and lentils with success. I generally don’t like goodies made with those types of beans but I love these cookies made with chickpeas. Please use chickpeas unless you have an allergy! Doing this in a blender won’t work and might kill the blender. Making these in a Blendtec blender or something equally powerful might work but I haven’t tried it. Adding random stuff like eggs… probably won’t work either. ;) Experimenting is great but I think this is a bad recipe to experiment with. But thanks to the experimenters who left feedback, I’ve been able to update the recipe with alternatives to honey and peanut butter. Thanks everyone! For a totally sugar free version, use 30 drops of Stevia and cacao nibs. Do not double the recipe! It might be too much for your machine and could damage it. For a vegan version, you can’t use honey. Use agave. For a dairy-free version, use Enjoy Life chocolate chips. They’re just as delicious as regular chocolate chips. SO good! 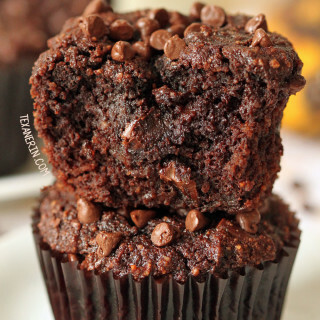 Want more gluten-free treats? Here are some of my favorites! Click below for a how-to recipe video for these peanut butter chickpea cookies! With wet hands, form into 1 1/2" balls. Place onto a Silpat or a piece of parchment paper. If you want them to look more like normal cookies, press down slightly on the balls. They don't do much rising. 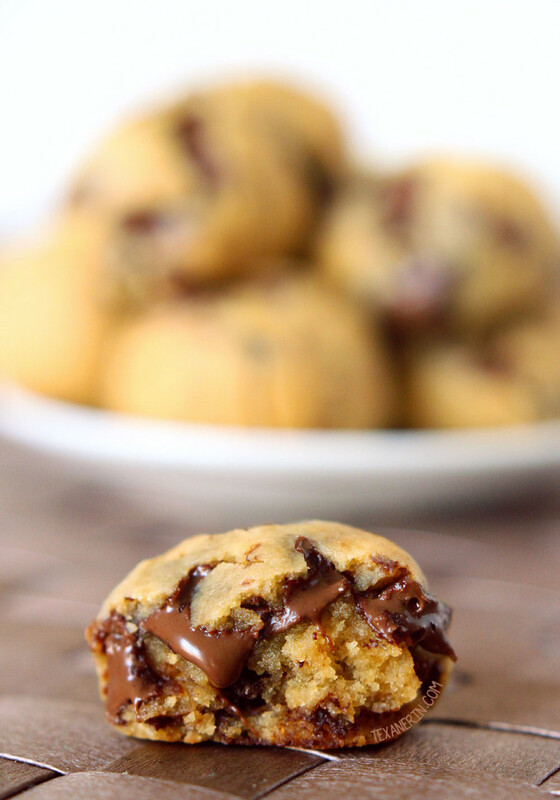 2030 comments on “The Original Peanut Butter Chocolate Chip Cookie Dough Bites Recipe (aka Chickpea Cookies)” — Add one! 3 comments are awaiting moderation! This is my new favorite snack! I didn’t have a food processor, so I used my electric hand mixer which still worked nicely. I also made a larger batch this last time with two cans of chickpeas, and just adding the other ingredients to taste. Thanks for sharing this recipe, and I look forward to trying your others too! You’re welcome! I’m happy to hear that the mix of nut butters worked well. And local raw honey! Yum. 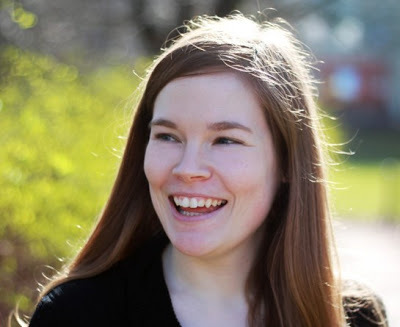 :) Thanks for your comment and I hope you’ll enjoy the other recipes just as much! H followed recipe exactly and they were delicious 😋! Feel less guilty eating these LOL whole family loves them! Haha. That’s always a good thing. :D Thanks for your comment! Just made these. Used my Vitamix and blended chickpeas, vanilla and maple syrup until they were smooth, then transferred to a bowl, and was able to mix in the other ingredients without a problem. Worked like a charm. Awesome! Thanks for the tip on how to make these with a Vitamix. :) So happy it worked well for you! I just made these, & they smell wonderful! The unbaked batter was delicious. I had to use Great Northern beans because we were out of chickpeas. I added raisins, sunflower seeds, crushed pistachios, & dried blueberries + lemon almonds instead of chocolate to make trail mix cookies. 🙂 Thank you for the recipe! Oh, wow. You added a whole bunch of goodness to the cookies and it sounds delicious. :) Thanks for the tip and for your feedback! Made these for the second time. I substitute peanut butter using almond butter and they are so delicious! Everyone loves them even the kids! The first time I made them with dark chocolate chips and I’ll tell you they are so much better with semi-sweet chips vs dark chocolate. Anyone know how many WW freestyle points these are? Oooh! I like how you think. Dunking cookies in chocolate is always a good idea. :D Thanks for your comment! I noticed this post of yours shared by one of my FB friends. Yes, the melting chocolate pics make everything look yummy! I’m out of work tomorrow for a snow/icy day, so, I’ll bake a little bit. Can’t wait to try them! Thanks for posting! I’m in the same boat. I made them today, they’re actually very good! Yay snow/ice days. You’re welcome! I hope you’ll enjoy them and that you’re having a nice snow day. :) Thanks for your comment! What’s the nutritional value of these? I’m so excited to try this now that I have a food processor! Does the chickpea come through at all? Not at all! And I hate chickpeas. I’d love to hear how they come out for you! Wow this is so unusual, but I can’t wait to try it! These are delicious! Not too sweet, super easy to make and will cure your chocolate/peanut butter craving. I am so happy I came across this recipe. My daughter doesn’t think they are sweet enough so next time, I will add some stevia root extract powder to give them just a bit more sweetness without adding calories. Bravo on a fantastic recipe!! That sounds like a great addition! I’ve been meaning to try stevia in these. I’m so happy you enjoyed them. :) Thanks a bunch for your feedback! I used 1 tbs Splenda naturals instead of honey or maple syrup and Lilly’s chocolate chips. Yummy! Lilly’s and Splenda Naturals are stevia based. Do you think they’ll be okay without the chocolate chips? I don’t want cane sugar and don’t have access to ones without it. Sorry for just now seeing your comment! Hopefully you found the answer in the post. I personally feel like they need the chocolate! Me too! Found the recipe about a month back and have made them 3 times. Such a simple and delicious cookie. Thanks for the recipe, and Happy New Year!! You’re welcome! So happy you liked them enough to remake so many times already. :) Thanks for your comment! I love the comment, in your years of blogging you learned people like close-ups of melted stuff. Hah! That’s why I came by when I saw this on FB this morning. It looked too good! I am printing, and will make with my kiddos today- school is closed. This will keep them busy for a bit! Thanks my friend. Oh, hi there! And yeah, I had only been blogging for a few months and Pinterest had just taken off and I got that figured out quickly with the melty shots. :D I hope you’ll all enjoy the cookies! Just made these cookies using natural crunchy PB, maple syrup, and Pascha organic chocolate baking chips (chocolate with rice milk). They’re a tiny bit crumbly and are starting to turn dark while still warm. They’re very delicious, and I’m not sure any of them are going to stick around long enough to make it to the freezer! Erin replies to Lauren H.
Oats sounds like a yummy addition! I’ll have to try that. :) Thanks for your tip! I just used Skippy Chunky and added a bit (2tbsp) of unflavored protein powder to balance out the extra oil… they were not at all greasy. I haven’t even baked them n I’m already in love i can’t stop eating the dough!! I was gonna just keep them to eat as dough but I’m gonna try half baked n half for my cookie dough craving haha! Thank u so much! I made these per the recipe but they came out very crumbly. Any advice? I don’t think anyone has mentioned these being crumbly yet! Did you make any changes at all to the recipe? I hope you could still enjoy them! I just made these and they are amazing! Even the picky eaters in my house really like them. I used almond butter, agave syrup and Krisda semi sweet chips (sugar/artificial sweetener free). My batch made 24 balls/cookies. I entered the ingredients into MyFitnessPal, each cookie ended up being 67.5 cal, 2.2g protein, 2.75g fiber, 8.8g carbs, 4.8g fat, 6.8g iron, 0.04g calcium. I just tried these the other day, and they were a huge hit. Definetely my new favorite! Do you have a picture of “these” cookies? The picture posted for this recipe is a picture of the original cookies without the peanut butter. What do you mean by “these” cookies? The pictures are of the recipe listed at the bottom of the page (and they have peanut butter in them). 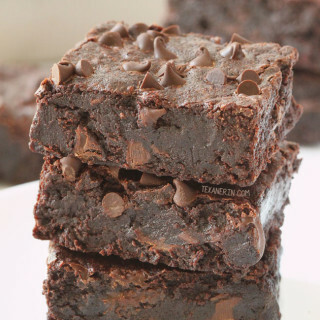 I just made these tonight and they are amazing! So quick and easy! I used the whole can of chickpeas and substituted with PB2 powder and HOLY MOLY were these good! I ate 3 right out of the oven, plated some, and put the rest in the freezer based on other comments saying to try them frozen! I’ve already recommended this recipe to 2 friends and plan on making these often! I want to try to mix things up and maybe add coconut flakes or make an oatmeal raisin version! Thanks for the healthy find! Oooh! An oatmeal version sounds interesting. I’d love to hear how that comes out! I’m so happy that they worked out well with your PB2 sub. Thanks for your feedback and for recommending the recipe to your friends! How much PB2 did you use? I made them a while ago but most likely just a scoop or more depending on how much peanut butter flavor you want. Do you have the Twister Jar? Give that a try! Where have these been all my life?!! So amazing!!! I used a store bought PB, Whole Foods 365 natural PB and they came out great! Not oily at all!! 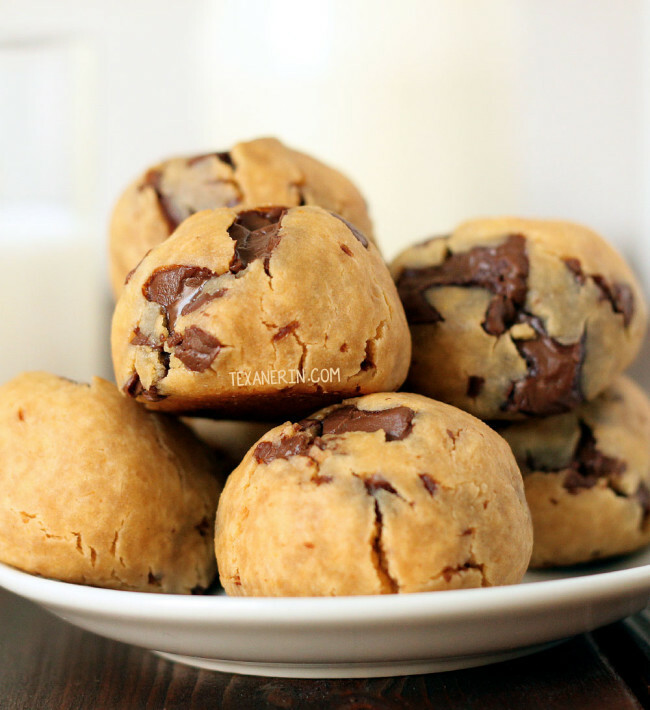 I wonder if you could add brewers yeast and make these lactation cookie dough bites??!! Hmmmm…..
I’m so happy you enjoyed them! Thanks for the peanut butter tip. I’ve never used brewer’s yeast so I have no idea how that’d work. Sorry about that and thanks for your comment! Hello! It was my first time ever making these and they came out kind of dry. I followed the directions to the T :(. Any advice would be appreciated! Thank you!! Hmm. I’ve gotten loads of reviews on these but I don’t think anyone has had them come out dry. The only thing that I can think of is that perhaps your oven is running too hot? If you followed the directions exactly and didn’t make any subs at all, it’s the only thing I can think of! So happy to hear it was a hit! :) Thanks for your comment and sorry for the slow reply! I’m in the process of moving and haven’t had internet since Sunday. I just saw this and going to make it tonight. I’m trying to do Atkins and this is close. Thanks. I tried to make this using pb2 and sugar free Walden Maple syrup. The batter was delicious but it didn’t really bake well. Took forever and still wasn’t cooked all the way through. Might have been because of my substitutions though. Just wanted to give a heads up to other future bakers. Wow! Thank you for this recipe! I haven’t tried it yet; but I’m looking forward to it! I am allergic to all grains, sugar, some dairy (and a lot of other things that have nothing to do with this recipe!). And because I’m trying to lose weight I avoid peanuts. I really appreciate the nut butter alternative, Stevia option and the small, side-recipe for grain-free baking powder! You’re welcome for the recipe! I’m so happy to like the options. :) I hope you enjoyed the cookies. Thanks for your comment and sorry for the super slow reply! I’m in the process of moving and haven’t had internet for a while. The stevia replaces the honey correct? What if your using powder stevia. How much would I use? Also could I use sugar free syrup? Aww! The champion of today! I love it. :) And good to know about the Sweetleaf brand for a sugar-free sub! I’ve been meaning to try that out. Thanks again for your comments! Erin– these cookies are a simplified version of a chickpea chocolate chip cookie recipe I’ve been tweaking for years…you’ve just unlocked the vegan in my seemingly unmatchable keyhole of an all-around extended-family friendly favorite!! 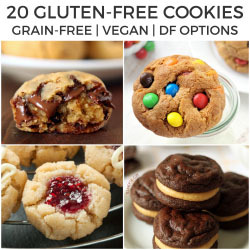 Of course you can use vegan- gluten-/ sugar-free choco-chippies…. These are amazing!! I used cacao nibs and maple syrup, with fresh almond butter….I can’t stop eating them. Thank you, Thank you, Thank you!!! You’re welcome! :) I’m so happy you liked them! Thanks for your comment. I made the recipe with organic brown rice syrup instead of honey. It worked perfectly. I make these are few times a week. Because they rock when they’re frozen they are a great addition to the banana based ice cream I make. I break the cookies apart and add them to the ice cream before I re-freeze it and tada!!!! Cookie dough ice cream! Hey there! These look AMAZING. Going to make these tonight :-D Do you use raw organic honey or just the regular honey? I feel like those are two very different consistencies… Thanks! hehe! Hi there! Thanks. :) You can use either because it gets blended up in the food processor, anyway. :) I’ve used both. But I’d save your raw honey since you’re going to be baking the cookies and that ruins the whole raw thing. Hope you’ll enjoy the cookies! I made these last weekend and am going to make them again tonight. Really good, soft-baked feel. I loved these even though they taste “healthier” than regular cookies. I used the entire jar of chickpea because I wasn’t going to use the remainder later on. I followed everything else exactly though. So good fresh outta the oven. And still good later on when room temp. I threw the leftovers in the freezer because I wasn’t sure how well the’d keep on the counter; they were edible right out of the freezer days later. I liked that! Thank you for this recipe!! I’m so sorry I didn’t see your comment until now! That’s interesting that you could eat them straight from the freezer. I need to try that! I’m happy you liked them, despite them tasting healthier than normal cookies. :) Thanks a bunch for your comment! I am a lazy baker and didn’t want to measure (that’s work!). So I threw in the entire can of chickpeas and dumped in what seemed like a reasonable amount of PB and honey and vanilla. I did measure the baking powder. Then I threw it all in an 8×8 and baked it at 350 for 20 minutes. They cooked nicely, we got 9 squares out of the dish, and the kids loved them. They held their shape wonderfully. Haha. Oh my gosh. Baking without measuring… :D I’m happy that they came out well with your random amounts of peanut butter and honey! And even better that the kids loved them. :) Thanks a bunch for your comment! Thanks for the recipe! It’s become a go-to Sunday evening dessert for us and we love that we can still enjoy that family tradition, but in a much, much healthier way. That’s great! I love that these are a go-to recipe for you. :) Thanks for your comment! First time making these today and they were delicious! I let them cool and went to put in airtight container and noticed the color changed. They are no longer the light freshly baked color like the photo but darker. It won’t stop me from eating them, just wondering if I did something wrong? I kind of laughed at some of the comments on here. I made the recipe exactly as shown and my cookies turned out DELICIOUS! My batter tasted just like the ingredients, it was good. Not like cookie dough batter but hey these are great ingredients here! I ate one right out of the oven and they are sooo good. The consistency is fine, it’s a little crumbly but again I would expect that with the ingredients provided. I can’t wait to freeze a few too like some of the readers did. These are such an amazing treat to add to my healthy eating, I’m so glad I stumbled across this recipe! With 1,800 comments, I’m bound to get some doozies. ;) I’m happy you enjoyed them! I wouldn’t say that they’re supposed to be at all crumbly, though. Since you followed the recipe, I’m not sure what could have caused that. It’s great you still liked them. :) Thanks a bunch for your feedback! Do you take all the skins off of the chickpeas? When I open the jar some are still on and some are off and it takes a long time to “skin” them. Thanks! I just tried these with sun butter, can chick peas, honey, and everything else. They were amazing immediately after. I stored them and did some stuff around the house. 2 hours later they’re turning green?!! I ate a few more, same taste. Not sure what’s going on..
Don’t worry, they’re okay. ;) Read the section called “My cookies turned green, what happened?” from the SunButter FAQ. I’m happy they’re still tasty! I haven’t tried them frozen! That’s good to know. :) Thanks for the tip and for your comment! I’m happy you didn’t end up throwing them away. I didn’t care for them room temperature or even straight from the oven, the texture was just off. Based on your review, however I tried them frozen and OMG, they are to die for! I gave some to my co workers and they had no idea it was made from chickpeas. A-mazing!! Thanks for the tip. It is Game changer. Huh! That’s interesting. I still only like them hot from the oven. ;) I’m happy you found a way that you can enjoy them and that you co-workers liked them, too! Can you do this without nuts? Thank you.